I overslept this morning, which was a pleasant surprise. I’d intended to get up so I could get going on everything i need to do today, but it simply wasn’t in the cards for me to wake up early (the way I did yesterday). Ah, well, it is what it is, and while I do have a lot of work to do today, if I buckle down I can get it done. I know, working on Christmas? Deadlines, alas, don’t get adjusted for holidays, and this is my punishment for allowing myself to get so behind in the first place. A few hours of good, solid work though, and I can take the rest of the day off. I also have tomorrow off (Paul’s going into the office) and this is my week of late nights (both Tuesday AND Thursday) so if I can get back on track with some good work today–I can still make the deadline. I will also do some reading. Yesterday evening I reread an old thriller originally published in 1975; that I think I read sometime in the late 1970’s/early 1980’s, when I was going through my first thriller reading phase: Valley of the Assassins by a long-forgotten novelist named Ian MacAlister, and it was set in the Middle East; more precisely, Iran, Iraq, Oman and then Saudi Arabia. 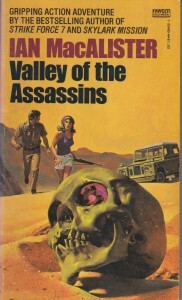 It’s an Indiana Jones-type tale (which I always love) about the search for the tomb of the Old Man of the Mountain, and all the treasure buried with him somewhere in the Arab deserts. It begins with the appearance of a strange map, lots of intrigue and adventure and double crosses, and it had some basis in history–the Old Man of the Mountain really existed (I first learned about him reading Thomas B. Costain’s The Three Edwards, and more in The Conquering Family; an interesting historical figure; he founded the Society of Assassins, and was greatly feared). It was also interesting to reread to see how much the Middle East has changed since the time this book was written, making it very dated. My thriller/intrigue period of this time was triggered by reading Alistair MacLean’s Circus and Helen MacInnes’ The Salzburg Connection back to back; I went through a very long period where I read many books by those two authors and books by others as well; eventually discovering Robert Ludlum, whom I really loved and read everything by until his death (I’ve not read any of the ‘co-written’ books published yearly since he died). Reading this, and thinking about these thrillers, has reminded me of something I periodically remember but then it slips away: an idea I had years and years and years ago that I wanted to write about as a stand-alone type book, which then evolved into a stand-alone novel with Colin from the Scotty series as the main character. This is an idea I’ve always loved and wanted to try. The Scotty series, if you will recall, began as a stand-alone and then evolved, because of the contracts, into a trilogy. The final volume of the trilogy was effectively split into two books: Mardi Gras Mambo and Vieux Carre Voodoo (and by this, I don’t mean the mysteries themselves; I mean the personal story of the guys). No one really knows much about Colin other than what he chooses to share with them, and there’s also no way of knowing if what he chooses to share is the truth, part of the truth, or not true at all. The fun thing about having a character who’s a secret agent for hire of sorts is just that: the mystery of who he really is. I thought it would be fun to write a stand alone adventure for Colin himself, so the readers could get to know him better–and know him better than Scotty and Frank do. The idea for the thriller I wanted to write, a thriller based in a treasure hunt based in history in the Middle East, easily melded with the thought of writing a stand alone thriller for Colin; in fact, using that idea for a Colin book makes the most sense. So rereading this book made me think of that book; and while it never really had a title, nor a definitive answer for what treasure he was looking for in addition to being involved in some international espionage, obviously, I’ve been thinking about it a lot over the last day or so. I’ve also, for that matter, thought about writing a book from Frank’s point of view as well. But the Colin one makes the most sense to me. Anyway, I digress, and need to get back to the spice mines.